The work site was within the town’s picturesque Smith Creek Greenway and was done to repair damage caused by flooding from Hurricane Matthew in the fall of 2016. Joe Wright could almost serve as the face of the small-business construction business in 2018. A young, college-educated man who, in a relatively short time, has built an outstanding reputation for himself and his specialized company, Wright Contracting LLC. Wright and his expertise is one of a growing number of young professionals that have embraced and “increased the flow,” as it were, of the burgeoning stream and wetlands restoration industry. This year, Wright Contracting, based in Siler City, N.C., celebrates its 10th year in business. In that time, the company has worked on environmentally-friendly stream and wetlands projects across the Southeast from Texas to northern Virginia and as far south as the U.S. Virgin Islands. 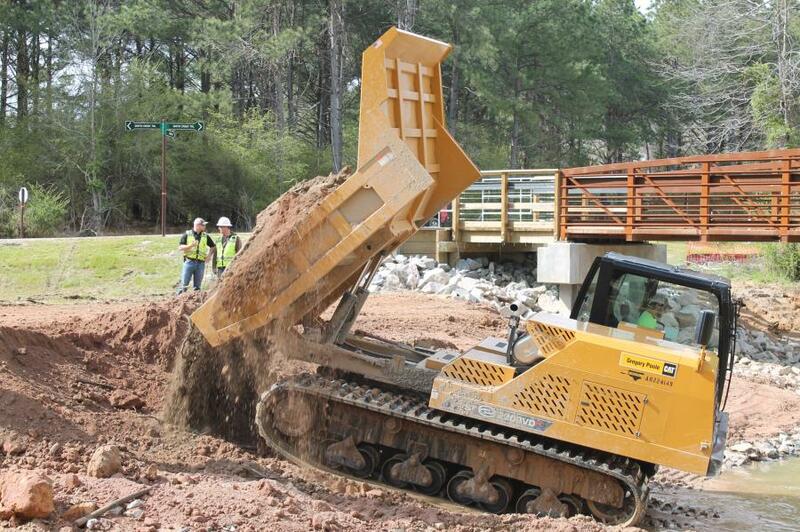 And it was at a stream restoration project last year that Wright realized he needed a highly-specialized machine to do the job properly. For that, he turned to his friends at Gregory Poole, a North Carolina construction equipment dealer. Based in Raleigh, the company serves construction professionals throughout the eastern half of the state. After working with the dealership and examining other machines, Wright decided on using a Morooka MST 2200VDR, a highly-versatile rubber track carrier, on his projects. It is another in a long line of distinguished machines built in the United States for the domestic construction industry. In a brief amount of time, the Morooka has already proven to be an excellent choice. Earlier this spring, Wright completed work on the restoration of an approximately 500-ft.-long stretch of Smith Creek, a small tributary of the Neuse River that flows through the town of Wake Forest, just outside Raleigh. The work site was within the town's picturesque Smith Creek Greenway and was done to repair damage caused by flooding from Hurricane Matthew in the fall of 2016. The park is relatively new and features a lengthened path along the creek, as well as a new pedestrian bridge over the damaged stream bank. The greenway also is near a pair of schools and is used by many students to walk to and from their homes. It is just this type of work where the Morooka pays for itself, Wright said. The MST 2200VDR is a small, lightweight rubber track carrier model designed with an upper structure that rotates a full 360 degrees, making for easy load deliveries without spinning the undercarriage. At Smith Creek and other stream restoration jobs where space is often tight, the Morooka's ability to rotate the upper structure also increases its maneuverability while also able to carry up to 12 tons of dirt and rock. Wright's Morooka operator at Smith Creek was able to allow a Kubota excavator to fill it with material on one area adjacent to Smith Creek before quickly moving down the creek bank, into the water and up the other side before rotating the bed 180 degrees and depositing the spoil exactly where it was needed. 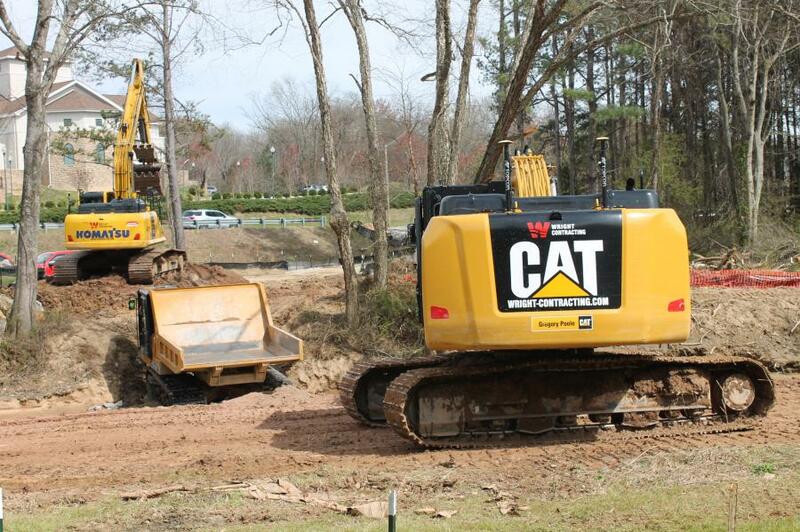 From there, a Cat excavator moved and spread the dirt along the adjacent stream bank. Despite the fact Wright Contracting used two large excavators on the Smith Creek project, he considered the Morooka to be the primary piece of equipment for the job. In the aftermath of the hurricane, Wright described the water flow as quite high and even during construction he and his crew saw the stream get within three or four feet of the bottom of the pedestrian bridge with a depth, he figured, of close to 16 ft.
A lot of stream restoration at public parks, he said, is designed to move the creek flow onto the flood plain and spread it out to mitigate having big torrents of water rushing through where pedestrian activity is occurring. It also gives the park an effective buffer for establishing growth for trees and native plants. Wright Contracting has seen steady growth since the company was founded in 2008. A native of western North Carolina, the business was started near his hometown of Lawndale, in Cleveland County. Even though fresh out of college at North Carolina State University, his love of environmental stream and wetlands restoration gave him the impetus to start a firm that quickly established itself as a go-to company in the region for the work. Storm-water remediation and other urban projects also are among its list of services. The entire stream and wetlands restoration business is a product of the modern environmental movement. Commercial development is only one factor that can negatively affect waterways, and if so, responsible companies and municipalities will bring in a company like Wright Contracting for help. One of Wright's projects in North Carolina involved a farm site where more than 5,000 ft. of a stream had degraded to the point that it became an ugly drainage channel. 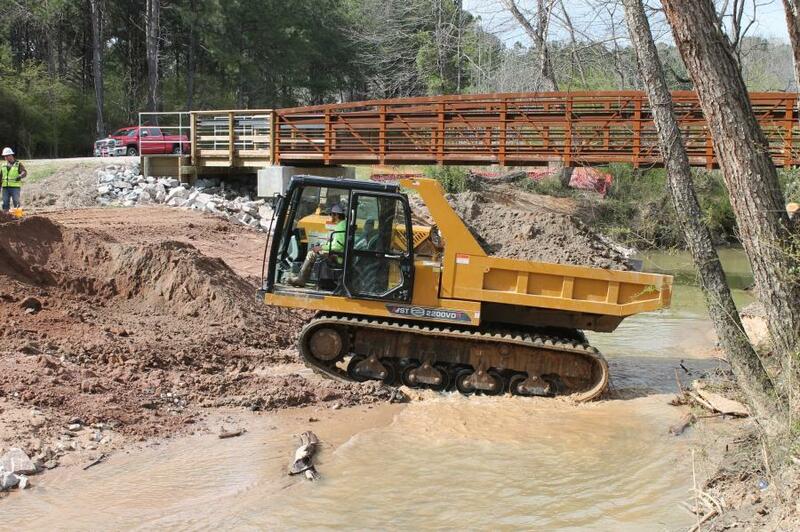 After his crews moved in and applied their expertise using the most up-to-date software-driven equipment, Wright was able to restore the creek's former natural beauty. But, Wright cautioned, the tasks his company performs are not something that any contractor can just immediately decide to do as a sideline to his standard construction work. Rather, it requires a great deal of training and years of on-the-job training. “I would say that stream restoration is a very hard market to break into and sustain as a business,” he explained. “You can't just switch from another type of construction to this because it is so inherently different.